L'Egypte est vaste. Voyez plus de choses que cela ne semble possible lors de la planification de votre propre itinéraire sur cette excursion privée de 7 nuits pleine d'action. Profitez d'une croisière de trois nuits sur le Nil, de trois nuits d'hôtel, d'une nuit en train-lit et de nombreux repas. Découvrez les pyramides de Gizeh, le grand sphinx, la vallée des rois, le majestueux Nil et bien plus encore, et passez la journée à faire de la plongée avec tuba dans la barrière de corail luxuriante de la mer Rouge. Profitez d'une croisière touristique de 3 nuits en pension complète entre Assouan et Louxor. I do feel I want to say something though the trip is still going on. Luxor Travel has paid its attention to all the details from the very first moment since I landed in the territory of Egypt. I am traveling alone this time I could make nothing without the helps of the fellows at Luxor Travel, at very high cost I believe. And I must give a big thumb-up to Dr. Ahmad El-Sesy, who showed me not only the sincere hospitalities, but especially the knowledge and the profession he has to the ancient Egyptian history and culture. With his passion to what have happened in Egypt 7000 years ago or just decades away, no stereotypes to Egypt and its people could stand or remain. I have visited Cairo, Aswan, Edfu, and now in Luxor and will move to Hurghada days later before end my short trip in Cairo. I highly recommended this package. Our expectations of this trip was beyond what we could have imagined. The personal touch of Ragab, Taha and Rambo were outstanding. Coordinated travel movements throughout the country allowed us to enjoy and see far more than we expected. The set up was excellent. I had searched other sites for a trip to this area of the world but found no other that covered so much in a timely and easy manner. 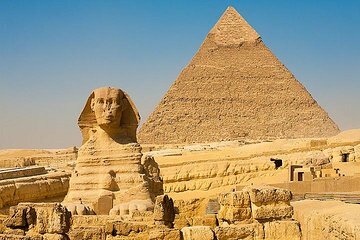 I highly recommend this tour to anyone planning to visit Egypt. I myself do plan to return with a longer agenda in mind. I read and studied so much of this land now I can say I saw, touched and experienced the land of Kings and Pharaohs.